BARNSLEY MP’s CLAIMS; Staffing, Office, Travel & Accommodation. The expenses of our local MPs; Dan Jarvis, Michael Dugher, Angela Smith & John Healey. Information based on an article in the Barnsley Chronicle 18th September 2015. 2014-15 Total for all four = £743,164.28 an overall increase of £32,581.06 or 4.6%. This equates to almost £510 per day! Dan Jarvis ranked 3rd of the four, however he was the only one who lowered his claims overall, the other 3 all increased their claims. Smith by just short of £25,000 or almost 14%. Jarvis whilst an MP for the period has the lowest staffing costs of the four. Lowest travel costs at just short of £5,000 which is 43% below those of Smith and almost £7,000 lower than those of Healey. Dugher’s are the most competitive at £16,500, Smith’s ranked next at £17,800, Jarvis at £22,400 and Healey £23,000. All the other three increased their expenses i.e. *Figures rounded up to the nearest £. On average the bill as compared to 2012/13 rose by £32,581 or 4.6%. *In other words more than double the rate of inflation over the same period. During the same period many working people have had to endure far less percentage increases in their wage packet, indeed many have received pay freezes. Some have had decreases enforced upon them by ruthless employers. Those on welfare and benefits have seen their meagre entitlements dwindle and disappear. It should not be forgotten that MP’s are paid by the public purse just like any other worker in the Public Sector, how many of them collectively increased their income by 4.6%? Had Dugher, Smith and Healey managed their expenses in a similar fashion as Jarvis, there would have been a saving of well over £34,500. Accommodation ranges from £13,719 for Dugher to £20,600 for Smith. Office costs range from £16,500 for Dugher again to £23,100 for Healey. There may be perfectly good reasons for these variances, location, rental, leasing, size, running costs and rent of premises. Travel shows wide and significantly differing costs, Jarvis by far away the most economical, his are below £5,000, Dugher’s are £1,936 above whilst Smiths are £6,500 and Healey’s £6,900 which are more than twice those of Jarvis. It would be interesting to hear the explanation as to why one can travel from South Yorkshire at more than half the cost of 2 of the others. *All figures rounded marginal differences in money/percentage terms. Staffing there are only marginal differences between Jarvis, Smith and Healey i.e. £138,000, Dugher’s is marginally above at £141,700. Each of the MP’s employs their spouses which is permissible i.e. Angela Smith employs her husband Steve Wilson full time as Senior Parliament Assistant who is paid between £35,000 and £40,000. John Healey employs his wife Jackie Bate part time as Office Manager and paid between £10,000 and £15,000. Dan Jarvis employs his wife Rachel Jarvis part time as Senior Secretary and paid between £5,000 and £10,000. The MP for Barnsley East Michael Dugher employs his wife Joanne part time in the capacity of Office Manager. However when it comes to her salary she is paid by her husband between £35,000 and £40,000. All my calculations will be based on the above salary level i.e. the mid points between the salary levels e.g. between £5,000 and £10,000 = £7,500, between £10,000 and £15,000 = £12,500, and between £35,000 and £40,000 = £37,500. I have assumed that a full time worker works 40 hours and a part time worker works 21 hours. To determine what the respective MP’s hired helpers are paid on an hourly and monthly basis I have applied my assumptions above and I have tabulated them below. The remuneration packages of the respective MP’s spouses are determined by their respective husband (Angela Smith) in her case and by the other MP’s for their wives. The hours worked are in the main part time with one exception i.e. Steve Wilson works full time. However when you turn to the financial rewards they are significantly different. i.e. Dugher’s spouse Joanne receives £37.20 per hour. £29.80 more than Jarvis’s wife on £7.40. £17.70 more than Smith’s husband for full time on £19.50. £24.80 more than Healey’s wife on £12.40. If you take the salary paid to the Barnsley East MP’s part time Office Manager £37,500, an hourly rate of £37.20 (21 hours per week). The rate of £37.20 per hour is £2.10p less than that of the cumulative total of the other three Barnsley MP’s who have a total hourly rate of £39.30. It should also be remembered that all the “gang of four” abstained from voting against the Tories Austerity Programme and its consequences have a greater impact on those on the lower scale of the earnings league. Let’s look at the millions at the bottom of the league, those on the National Minimum Wage (NMW). The rate for the NMW at the time of analysis is £6.70. The difference in hourly rates are very alarming they bear no resemblance to the way in which the Labour MP’s pay their spouses, although to be completely fair, Jarvis is the closest to the NMW i.e. 70 pence above but that is just short of 10.5%. Nearest to the so called “living wage” which is to be phased in over a period of 3 years. It should be remembered that it is the Conservatives that are responsible for the introduction of the Living Wage; Labour should hang their head in shame. N.B. The Gang of Four are members of the Labour Opposition. If you calculate on a numerical comparison i.e. 4 MP’s spouses and 4 workers on the NMW, it shows in stark reality the differences in both remuneration and the hours needed to receive that reward. So those on the NMW receive an hourly remuneration that is £49.70 less than MP’s spouses. Equally to receive their pay they work 228 hours per month more or 2,736 hours per annum. It appears a fairly common practice for MP’s to employ their spouses in various administrative capacities. However is it morally acceptable? Could some of those positions be both occupied and performed by any of their respective constituents? Some of which may be in receipt of low pay or even on NMW! My final comparison is how much do MP’s spouses receive more than those on the NMW n.b. I have already highlighted Dan Jarvis’s (see page 2 Para. 3) case, the other three are listed below. John Healey £5.70 more per hour than NMW. Angela Smith £12.80 more per hour than the NMW. Michael Dugher £30.50 more per hour than the NMW. Anyone who receives £6.70 per. Hr. (NMW) gets £13,900 per. Annum; if they equally work part time they receive £7,316. Angela Smith Penistone full time (40 hrs.) Parliamentary Assistant receives £37,500. It will take anyone on the NMW over 2 years to earn the above. Michael Dugher Barnsley East part time Office Manager receives £37,500. Which is £23,600 more than a part time worker on NMW. Indeed he/she would have to work over 5 years to earn the equivalent of £37,500. I need to draw this analysis to some kind of conclusion and before doing so it should be remembered that I have only had the financial information and statistics of the four MP’s for the Barnsley area. There are well over 600 MP’s, what are their individual staffing costs, travel expenses, salary arrangements, employment practices, Annual year on year increments? Are there any different Party Political Policies? Would there be any cost savings to be made if you examined the whole political spectrum? More pertinently would those savings make a contribution to the national Deficit? Well are we? Not according to this analysis of the Barnsley MP’s. Indeed let’s not forget that all MP’s were recently bequeathed a £10,000 Annual Increase to their salary. For the 649 members who sit in the House of Commons that’s just marginally short of £6,500,000. That’s an ironic coincidence; £6,500,000 is over 50% of the proposed targeted cut to the Welfare Budget. Well my Right Honourable friends a more appropriate description can be taken from the Bible. Comments Off on BARNSLEY MP’s CLAIMS; Staffing, Office, Travel & Accommodation. 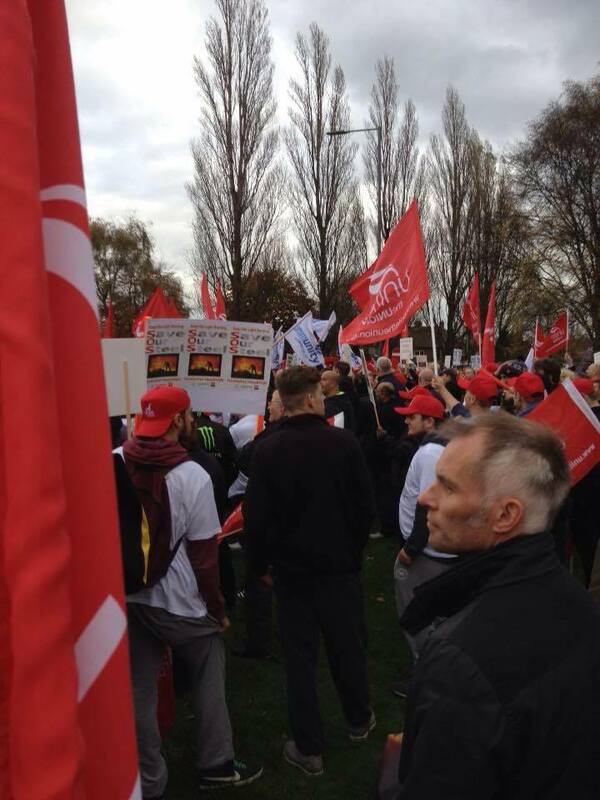 Unite on the march in Scunthorpe to Save our Steel industry today. 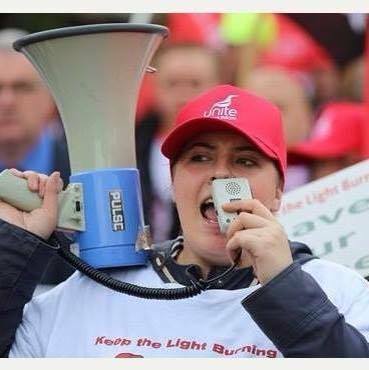 Don’t forget you can support Charlotte and other Unite activists by attending next weeks meeting at the NUM, where Charlotte is speaking and on the 21st on the Sheffield Demonstration! This fantastic report from Gerry in the Leeds Community Branch originally appeared on their website here. A well-attended conference took place on Saturday 31st October in Birmingham. It was called by Unite Community (Unite the Union’s community wing) and the Public Services and Commercial Services Union (PCS), which represents workers in the Department of Work and Pensions. It was not only attended by members of these two organisations but also by other groups concerned with social security problems and reform, such as Black Triangle, Disabled People Against Cuts (DPAC) and Derbyshire Unemployed Workers’ Centres. Two delegates from Unite Community Leeds also attended the conference. The purpose of the summit was ‘to challenge the myths around ‘welfare’ and build a coalition to fight for our safety net’. equality in the labour market and in access to benefits. On the basis of the charter and in the context of the current climate, Fran argued for the need for joint campaigning. Steve Turner, Deputy General Secretary of Unite, gave the main opening address in which he painted the broader political and economic context of the struggle for improved social security. He rooted today’s political situation in the rise of neo-liberalism, which began in Chile in the 1970s and was then imported to Britain by Mrs. Thatcher. Following the banking crisis, the Tories are now engaged in an attempt to reinforce this system by means of austerity, through ideological attacks and by silencing the opposition. An essential part of the Tory project, it was argued, has been to change the narrative about the relationship between the economy and society in order to justify government policies. So, for instance, divisions are drawn between so-called ‘strivers and shirkers’, suggesting that the social security system is too generous, even though spending on it is proportionately lower today than it was in the 1980s. But even in-work benefits are now being targeted for cuts. Steve also argued that the Trade Union Bill is a means of attacking the organised working class and silencing the opposition, a tactic reminiscent of the early silencing of trade unions under fascism. Meanwhile the changes in constituency boundaries will disadvantage Labour and up to 2 million votes may be lost under the voter registration process, which will inform the boundary changes. These and other policies are far-reaching changes, yet the Tories only have the electoral support of 24 per cent of the voting public. In other words, their policies lack legitimacy. Jeremy Corbyn’s election as Labour leader, Steve suggested, has given us a moment of hope. The trade union movement has to stand up to attacks and the groups represented at the conference are key in that. There is a long tradition of civil disobedience and bad laws have been broken in the past. He urged the conference to be confident and to resist. There were also a series of ‘campaigning workshops’ throughout the day. There was one on building a broad based coalition on how to engage with charities, religious bodies, foodbanks and non-governmental organisations (NGOs). Another looked at equality and the participation of women, disabled people, young people and black and ethnic minority communities, who are all disproportionately affected by the cuts. One workshop considered the Welfare and Work Bill and what it will mean and how it can be campaigned against. There was also a session on lobbying political representatives to win political support to stop the cuts. Following Steve’s Turner’s point about the ideological attacks involved in Tory policy, one very well attended workshop focused on reversing or ‘changing the narrative’, which asked the question: ’how do we use the media to get stories out of the true effects of the cuts to the welfare budget’. This is a tough but necessary task, otherwise it will be difficult to shift public opinion. Mark Serwotka, PCS General Secretary, kicked off proceedings in the afternoon and his focus was specifically on social security. Echoing some of Steve Turner’s themes, Mark observed how millionaires had been enriched at the expense of poor people. Austerity, he argued, was indeed ‘a political choice’. The stakes were high in the campaign against social security restructuring, literally, at times, a choice between life and death given the increasing concern about links between the suicide of some claimants and government policy. It was time, Mark argued, that the trade union movement took social security in general more seriously than it had done in the past. He therefore welcomed the conference and the grassroots activity that had inspired it and that had forced social security more on to the trade union agenda. Historically, the social security system has changed. Mark noted that when he worked within it in the 1980s it was more supportive of people but now staff were pressured to trip claimants up and threaten them with sanctions. Job centre staff increasingly operate under the threat of disciplinary action. Mark argued that there shouldn’t be any sanctions; sanctions don’t create jobs or help people. However, he said that it would take more than the PCS to defeat sanctions. While the fact that the DWP Select Committee report on sanctions had called for an independent review was a start, more needed to be done. The presence of Jeremy Corbyn and John McDonnell at the dispatch box in parliament presents us with an opportunity to raise our concerns. Social security needs to become more firmly part of the anti-austerity campaign. Mark suggested we need to argue for more housing, particularly for younger people, and that rates of housing benefit to landlords should be lowered. He raised the idea of strike action across the public sector against the one per cent pay freeze. Signs of hope were also reflected in community campaigns, in the recruitment of new members to the Labour party and in the launch of Momentum. The PCS win on the struggle at the National Gallery has also been hopeful and inspirational. The TUC, he argued, should be put under pressure from below on social security questions, to argue for a more generous social security system with higher benefit rates. Towards the end of the conference there was an opportunity for grassroots activists to talk to the conference as a whole about their work. Issues that emerged here seemed to revolve around two broad themes: campaigning work and support work, although in reality they often overlap. Speakers from DPAC, Unite Community Durham and Derbyshire Unemployed Workers’ Centres spoke with great experience, clarity and inspiration about their work. On campaigning, Paula Peters from DPAC, for example, emphasised the importance of maintaining maximum visibility in fighting for campaigns like those against Work Capability Assessments. Examples of DPAC’s work that were given reflected this, such as their social media campaigns and direct action, for example, the ‘balls to the budget event’ earlier this year. She also rightly urged campaigners to put aside differences and unite on common ground in defence of the welfare state. The other two speakers, Angela Appleby from Unite Community Durham and Colin Hampton from the Derbyshire Unemployed Workers’ Centres both combined support activities, such as welfare rights advice and food and clothing banks, with more explicit campaigning work, for instance, DWUCs die-in organised in protest against the suicides of people who were unemployed and, in Durham’s case, campaigning work against sanctions. Unite Community Durham also emphasised the importance of skills training such as IT training, which is available in their centre. Interestingly, Durham are also developing work with prisoners. Colin commented that the election of Jeremy Corbyn provides a moment of hope and less nervousness in the Labour Party about their connection to welfare. Such a moment, Colin suggested, would be a good time to lobby politicians to press for support for the welfare charter. The final part of the conference involved questions and contributions from the floor of the conference. These included a brilliant suggestion from a member of Black Triangle who proposed that Jeremy Corbyn and Angus Robertson from the SNP be lobbied from the conference to devote a whole Prime Minister’s Question Time to the death of claimants subjected to the Work Capability Assessment (WCA). The case of Michael O’Sullivan is very relevant here as the coroner drew the link between his suicide and the WCA. Other issues and questions included the rights of people with Down’s Syndrome, funding the Morning Star as ‘our newspaper’ and the suggestion that Unite Community take up the cause of carers who receive less than recipients of JSA. There was also a plea to take people with addiction problems more seriously. They are often excluded from mainstream society as many of them – in the experience of one delegate – were often more capable than the stereotypes attributed them. Once empowered, their contributions can be ‘impressive’. Liane Groves, Head of Unite Community, closed the conference by emphasising need to follow up with a campaign strategy and, for starters, suggested a national day of action against sanctions on 16th March, 2016. Overall, this excellent conference was an opportunity to understand the wider context and issues in the struggle for better social security as well as to be inspired by many outstanding contributions. All of this should help in developing more effective local and national campaigning. However, one key lesson from the day is that ‘changing the narrative’ is crucial in the struggle to mobilise opinion in wider society if social security policy is to be moved in a more humane direction. We will then march to the council offices in time to attend their meeting. Let’s get our voices heard! As you are aware discussions have been taking place about holding a rally to ‘Save our Steel’. Sheffield City Hall has been booked for the rally on Saturday 21 November. Over the coming days we will be seeking to firm up speakers and other guests for the rally, which is set to start at 2pm and finish at 5pm. Families will be welcome at the event, which is aimed to celebrate our steel and metal industry and send a strong message to the government to ‘Save Our Steel’. There will be speakers, music and face painting for the children. I will update you all on speakers and promotional leaflets and posters, which are being designed and being sent to the Regional Office for distribution. In the meantime can you please get the word out to our Activists and Members. Details of transport will be provided as soon as possible. Please make every effort to come along to City Hall Sheffield to celebrate and support the UK steel and metals industries. Meeting “Refugees are welcome here” – this is now supported by the Trades Council and by Stand Up to Racism. It will take place on Saturday December 5th at 11am in the central library on Wellington Street. You may be aware that the South Yorkshire Casuals, a far right group, are planning to demonstrate against immigration outside the Town Hall at 2pm on that date. Their slogan is “Its not immigration its an invasion” and they are clearly trying to create divisions and hatred in our community. An open meeting has been organised for Tuesday November 10th at 7.30 in the YMCA on Blucher St (just up from the post office) to discuss how those of us opposed to racism can show that these people do not represent the people of our town. The meeting is supported by People’s Assembly, the trades council, Stand Up to Racism and others. Please do your best to get along and be part of the discussion on how we can build a broad coalition of resistance to these racists. Public meeting “No Fracking in Barnsley” – Thursday Nov 12th, YMCA 7.30, hosted by the Green Party and Frack Free South Yorkshire – all welcome. Regional People’s Assembly Sunday Nov 15th in Leeds, 11 till 5.50. We are entitled to 5 delegates to the day. 3 people are already planning to go (by train) – please let me know if you would like to attend. Sat Dec 5th is also the date of the People’s Assembly National conference in London. Obviously this clashes with the important anti-racist activity detailed above, but we would be glad to see someone delegated from Barnsley. Again please let me know if you would like to attend. Our next planning meeting will be Wed Dec 2nd 5.30 Barnsley library. All welcome. If you are in touch with other networks/individuals who may be interested in these events, particularly the events on 10th Nov and 5th Dec please feel free to circulate this information. A funny story from Barnsley in response to The Tory’s Trade Union Bill. 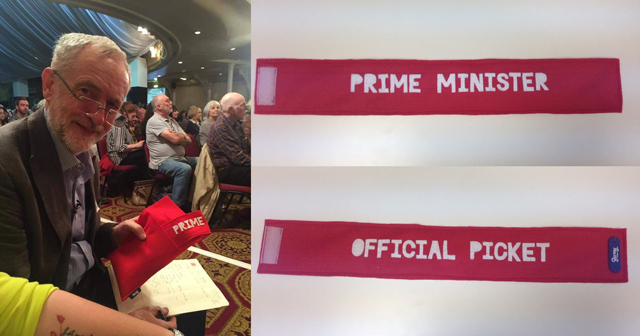 Barnsley’s very own Barmy Bunting has made Jeremy Corbyn an official picket arm Band! Barnsley Trade Unionists gathered outside of the town hall on Monday to protest against the Tory Trade Union Bill, in solidarity with the protest held simultaneously outside of the House of Parliament. 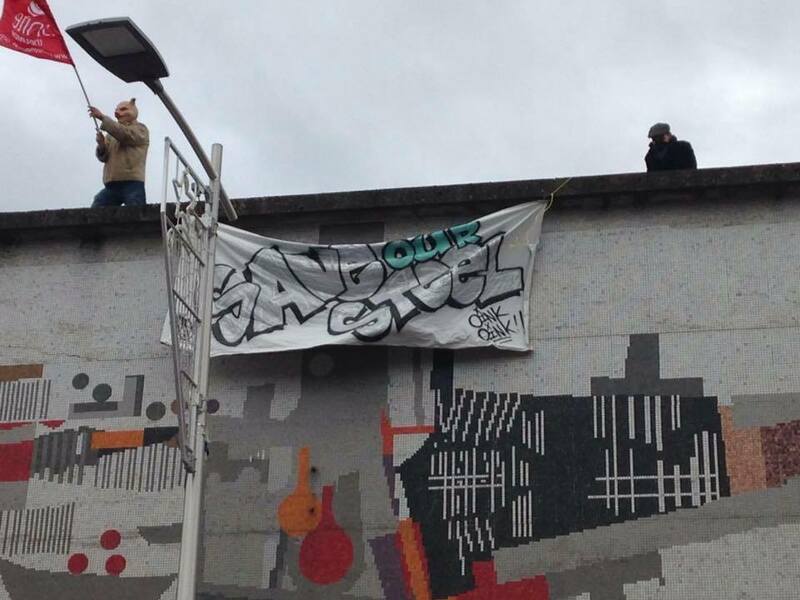 The rally also drew attention to the case of Sandy Nicoll, a Unison activist at SOAS University of London, suspended by SOAS management on charges of “gross misconduct”. They accuse Sandy of facilitating a student protest that briefly occupied the directors office. Monday 9th November – a small delegation of Freedom riders to meet with First Bus in Rotherham to discuss extending Stagecoach free early hospital travel to First Bus as well. Saturday 14th November – Group of Freedom Riders to go to Unite the Resistance conference in London. If anyone else wants to join that group please get in touch as soon as possible. Wednesday 18th November 7pm Miners Hall, Victoria Road, Barnsley – a Barnsley Trades Council Public Meeting against the Tory anti-union laws. One of the main speakers is Tosh McDonald – one of our major national supporters. He spoke about Freedom Riders at the Labour Conference this year. Wednesday 25th November 11am – Black Balloon release in Barnsley precinct.This will be the day the government announces how many pensioners died of cold last Winter. Groups across the country will be doing balloon releases to show how little the government does to stop pensioners dying every Winter. We also agreed to try to get Sheffield supporters together to have a more effective group there. John Baker is keen to have a meeting in Sheffield of Freedom Riders. If you are interested in helping this then get in touch with John by emailing: jonjoepeel@yahoo.co.uk. Our next full meeting is Thursday 12th November 11am Barnsley Library. 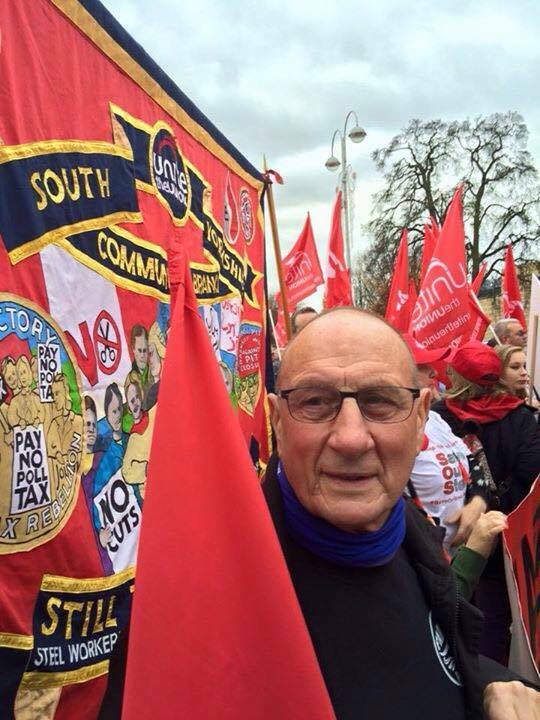 Monday November 2nd sees a mass lobby and protest outside Parliament against the Tories’ Trade Union Bill. Many local unions have delegations going to London to lobby our MPs. Barnsley Trades Council is calling a protest at 5pm on Monday 2nd November for those activists and trade unionists who can’t make it to London. We will be on the steps below the fountains, next to the Town Hall. Bring placards, banners and anything else that will make us visible and noticed. 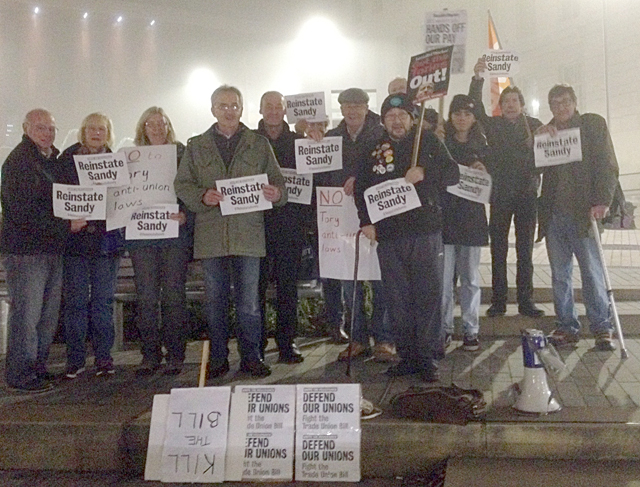 The last protest was quite successful with nearly 40 people on it – with a picture in the Chronicle. We can achieve the same again. Unite members in the steel industry came to Westminster to meet with labour MPs to talk about how we can save the steel industry and a wider manufacturing strategy. A strategy that this Conservative government appears not to be interested in. This government wants to leave thousands of workers, their families and communities to the whim of the market. Please watch and share this short video.